The VIX – The Missing Piece In Your Trading Decision Making? This week, Mike Smith shows us how to use the VIX to help make better trading decisions. This article aims to outline what the VIX is and how it can be used in a trading context for indices, stocks and options. Although there are opportunities to trade the VIX itself (via futures and options), our focus is on what the VIX can offer on trading decision-making when trading other vehicles to give you an extra edge. Note: There are other ways we can use the VIX for choosing particular types of options strategy but these will be covered in a future article and so here we are discussing directional trading. Interestingly, there are VIX measures on some commodities e.g. gold and oil on the CBOE, and there is some support for a correlation between the VIX and the USD. These are beyond the scope of this article, but nevertheless an understanding of the VIX could help further exploration of these. VIX is the ticker symbol for the CBOE Volatility Index, a popular measure of the implied volatility of S&P 500 index options. Often referred to as the “fear index” or the “fear gauge”, the VIX represents one measure of the market’s expectation of stock market volatility over the next 30-day period. To understand how this may influence markets and your decision making let us take a step back and review volatility in this context. Quite simply, volatility is all about the amount of fluctuation in the price of an underlying instrument. It is NOT directionally specific. Historical volatility is a “look in the mirror” measure and is a reflection of the range of movement in the underlying asset over a previous period of time. Implied volatility (IV), which is the type of volatility seen in the VIX, is a measure seen in the pricing of options that is FORWARD-looking and reflects the market sentiment of a future fluctuation in price. Again to reinforce, this is not a reflection necessarily of a directional move, merely the perceived “likelihood” of a price movement away from that which is current. The most obvious example of this may be seen in the options pricing before a company reports. There is no time generally speaking when a price is more likely to move from that which is current, whether beating or missing expectations the result is that stocks may move significantly. The market of course knows this, and it is seen in higher options premiums and creates the higher implied volatility. So, if implied volatility has theoretically no direction attached, why then is the VIX commonly referred to as the “fear index”? Again, let us look towards market behaviour as our guide. We have all heard the cliché “prices climb up the ladder and fall down the elevator shaft”, quite simply this refers to the perception of a stock moving downwards faster than it climbs, which in turn arguably reflects general perception of risk. So, in times when risk is seen as high, traders see the potential for downside risk greater than that of upside gain. Hence, during such times outside of earnings reporting, we see increased demand for the “protection” that options can often provide, as the threat of downside risk appears to be increasing. This impacts on higher options pricing and consequently the VIX index. Conversely when the market sees risk diminishing or calm, this again is reflected in lower options prices and subsequently a drop in the VIX. So there is an inverse relationship between the movement in the VIX and that of the S&P500. 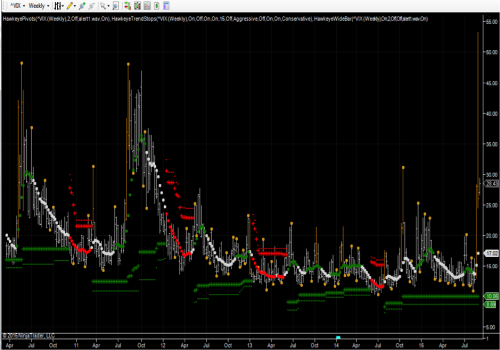 Compare the times when the VIX has spiked compared to an SP500 chart. You will see that any pull back or correction even in a bull market has been accompanied by an opposite move in the VIX. 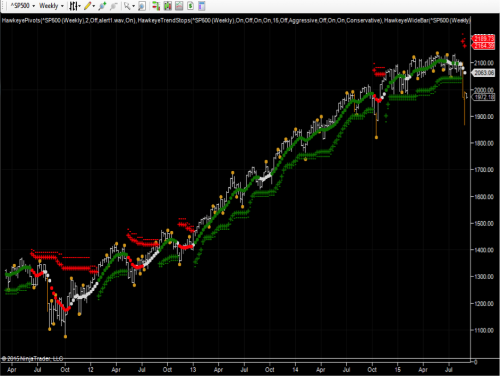 Here is the SP500 for the same timescale. Of course in our decision making we are using tighter timeframes than weekly charts, but we thought it important to see this relationship in action. One of the KEY things that Hawkeye indictors provide, as an underpinning concept, is the opportunity to trade with leading not lagging indicators. This is what can give you a distinct trading edge (i.e. an advantage over other market participants). So in reality, not only is there this inverse relationship but also often the VIX can be seen as leading, i.e. change in the trend of the VIX may be seen on many occasions before the major impact on the market. Three important questions with the VIX and trading? What impact could this have on entry decisions including strategy selection (e.g. 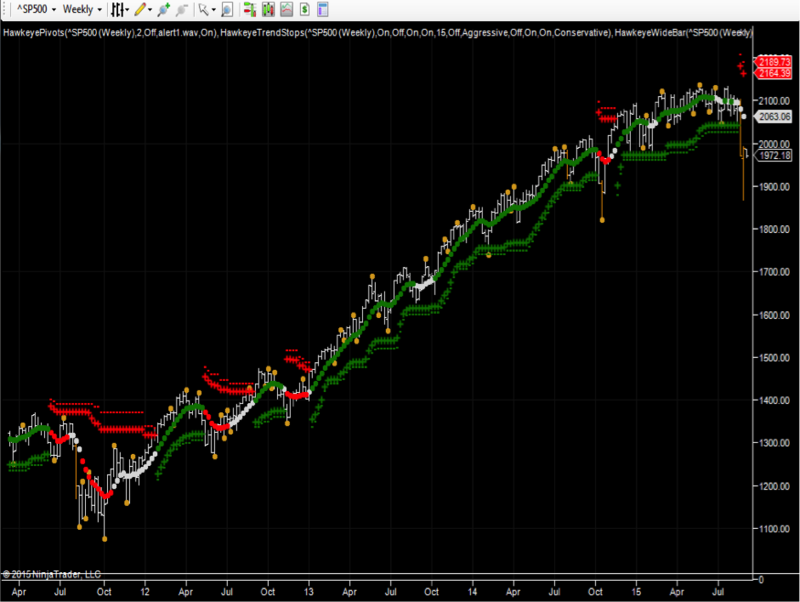 which options strategy or timeframes if trading ES)? What impact could this have on position sizing? What impact could this have on exit decisions? To answer these three questions we must know what is happening to the VIX. Quite simply the VIX can be high or low and rising or falling. As with any financial instrument, trend can be seen clearly using the indicators you already have at your disposal. In many ways, in the same way it is for the price of any instrument, it the movement of price rather than price itself which is important here. Being able to see changes in market trend could be crucial and of course you have the Hawkeye Trend as your ideal guide. So, in terms of the implications for trading direction, whether the VIX is high or low is a reflection of what has been, the trend is a reflection of what could be next. Generally speaking therefore, the VIX in uptrend is likely to add to the weight of evidence for a short position and vice versa. Should you be considering a direction long trade if the VIX is in new uptrend or going short if the VIX is in downtrend? To action either of these is surely going against the underlying market sentiment. If considering a directional position and the VIX is in congestion should you be considering a smaller position size? If in a position and the VIX changes trend against the direction you are going, should you be considering earlier exit or tightening a trail stop? As with anything you read, it is up to you to explore and test for yourself to see how this works in the context of your trading. Hawkeye entry rules always still apply in terms of Trend and Volume. Match the timeframe of the VIX with the fastest timeframe of the instrument you are trading. E.g. if trading an options or equity position then daily. If the VIX is in downtrend and SP500 in uptrend, this may be considered additional evidence for a high probability long position entry or accumulating into an existing long position in a underlying instrument that meets Hawkeye criteria. If the VIX is in uptrend and SP500 in downtrend, this may be considered additional evidence for a high probability short position entry or accumulating into an existing short position in a underlying instrument that meets Hawkeye criteria. If the VIX and SP500 are in identical trend it maybe a leading signal that the trend is about to change, therefore if you are to trade do so in the direction of the SP500 with your chosen instrument but consider reducing the size of the position. If you are in an existing position and the VIX changes to match the direction of the SP500 then consider tightening any trail stop or exit the position. You of course have two choices from what you have read above. You can take action and explore this further, or of course do nothing and move onto the next interesting thing to read.